Wireless services became increasingly sophisticated as technology developed. Ocean newspapers originated as early as 1899, when Marconi, sailing from the United States on the liner St Paul, produced a single sheet of news derived from wireless messages, for the benefit of passengers as the liner neared Britain. In subsequent years, with increasing range, news was conveyed to ships at more distant positions and incorporated into pre-printed newspapers containing more general articles. 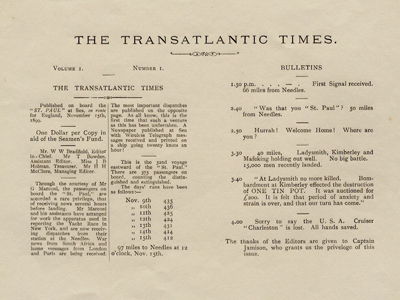 The Transatlantic Times: ocean newspaper produced on the St Paul, 1899. Marine Auto-Alarm set, by the Marconi International Marine Communication Co. Ltd., c. 1920. This system was one outcome of the Titanic disaster. If a ship had only one wireless operator, he could sleep without fear of missing an emergency messsage. Marconi Collection: Inv Num 14147, Inv Num 22770, Inv Num 34759, Inv Num 41271, Inv Num 82360.